Ethernet has become the preferred connectivity and networking solution for mid-sized businesses providing greater bandwidth, performance and resilience over ADSL and FTTC services. 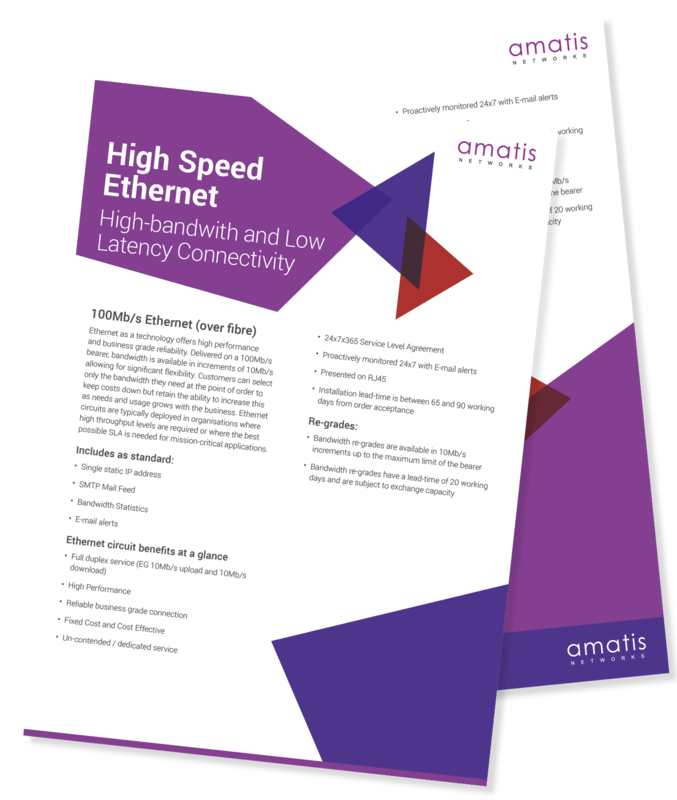 At amatis we operate and offer the full portfolio of Ethernet services providing our customers with the ability to select the solution that best fits their needs today with the flexibility to scale services as and when required. Our fully managed services can be deployed quickly, are fully supported 24×7. All of our Ethernet services are fully connected to the amatis cloud providing you with a range of cloud services on-net. 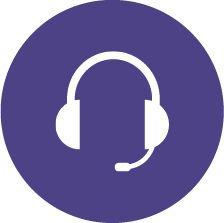 Support – our team operates 24×7, proactively monitoring your network and being there to ensure any issues are quickly identified and fixed. 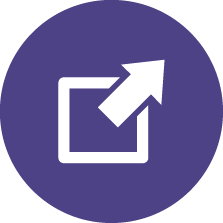 Resilience – not only do we look to ensure that each circuit delivered is as resilient as possible, we also work with you to ensure that when required connectivity can be backed-up by secondary options such as ADSL or 4G. 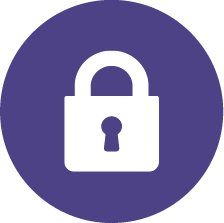 Secure – as dedicated point-to-point connections, we are able to secure your private wide area networks which can be fully complemented by our private cloud options. 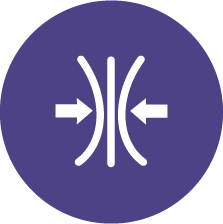 Scalability – we offer the full range of Ethernet connectivity ensuring that we are not just the right provider now, but that we can be a true long-term partner delivering and scaling our services to align to your needs. 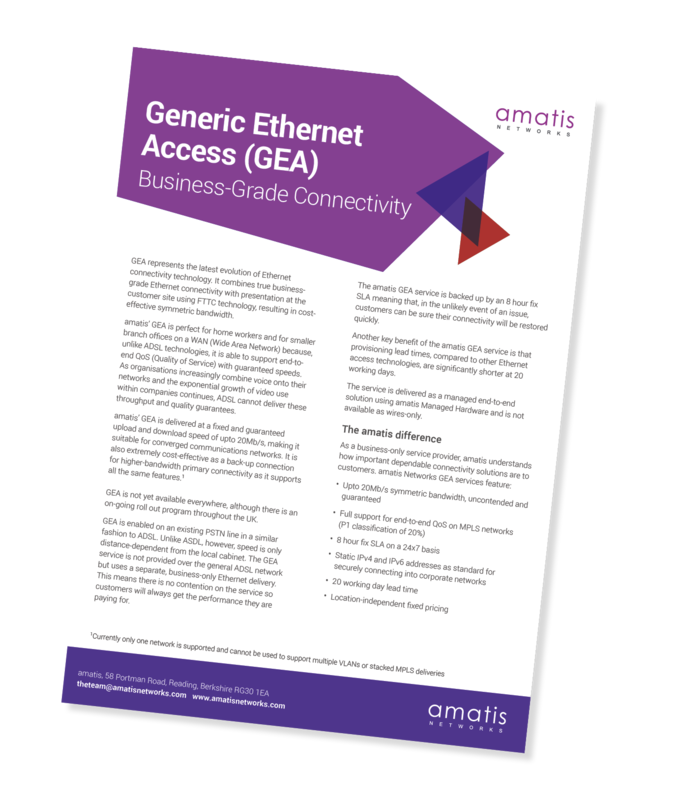 Our Generic Ethernet Access provides you with true business-grade Ethernet connectivity delivered cost-effectively through fibre-to-the-cabinet (FTTC). It is ideal for home workers or small branches that operate on a wide area network (WAN). With the ability to support end-to-end Quality of Service (QoS), it supports business-critical application access, VoIP and video. amatis is able to deliver this service where it is supported at the local cabinet, and quickly, with lead times of around 15 working days. We offer GEA as a fully supported service with both a 24×7 support option and an 8-hour service restoration SLA. With this service you gain the benefit of the first mile from your premises to the amatis network to utilise Ethernet and as such deliver an uncontended service. This is ideal for organisations looking for a low-latency service and a bandwidth of up to 35Mbps. 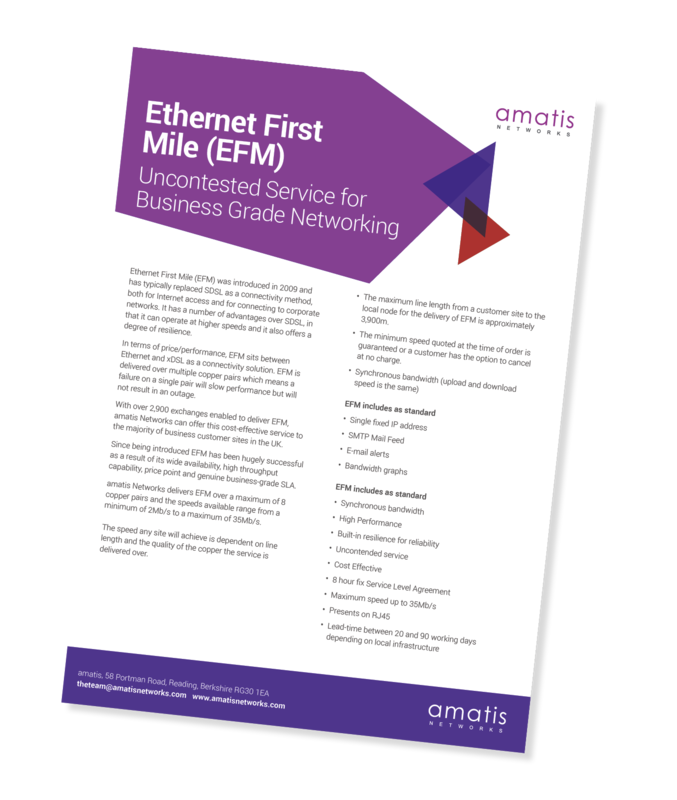 Ethernet First Mile (EFM) provides a cost-effective step up from ADSL and is provided as a fully supported service from amatis with the ability to select 24×7 support and a 8-hour service restoration SLA. It also provides you with high-performance access into amatis cloud services and the ability to support a private cloud environment. By deploying a Fibre Ethernet service you gain carrier-class Ethernet provided as a dedicated point-to-point or internet connection. This is an uncontended service, you are not sharing bandwidth with others. Delivered over 100Mb/s, 1Gb/s and 10Gb/s bearers, you have the flexibility to scale your connectivity to meet the changing needs of your business. As Ethernet experts, we are able to determine the right bandwidth for your business and configure the appropriate Class of Service (CoS) for your needs. We can deliver these services as direct internet access or as part of a fully managed MPLS network, both of which are managed and supported 24×7 by the amatis team. This is a carrier-class Ethernet service that is delivered over optical fibre providing a dedicated point-to-point or internet connection. As a dedicated service you are not sharing bandwidth with other network users and as such the bandwidth you select is the bandwidth that is guaranteed. Ethernet over Fibre Leased lines gives you flexibility and scalability, circuits can be delivered as 100Mbps, 1Gbps and 10Gbps bearers and then you are able to purchase the required bandwidth in increments to meet your needs. As technologies continue to evolve businesses have an increasing number of options and it often looks daunting when trying to identify which service is best for your needs. 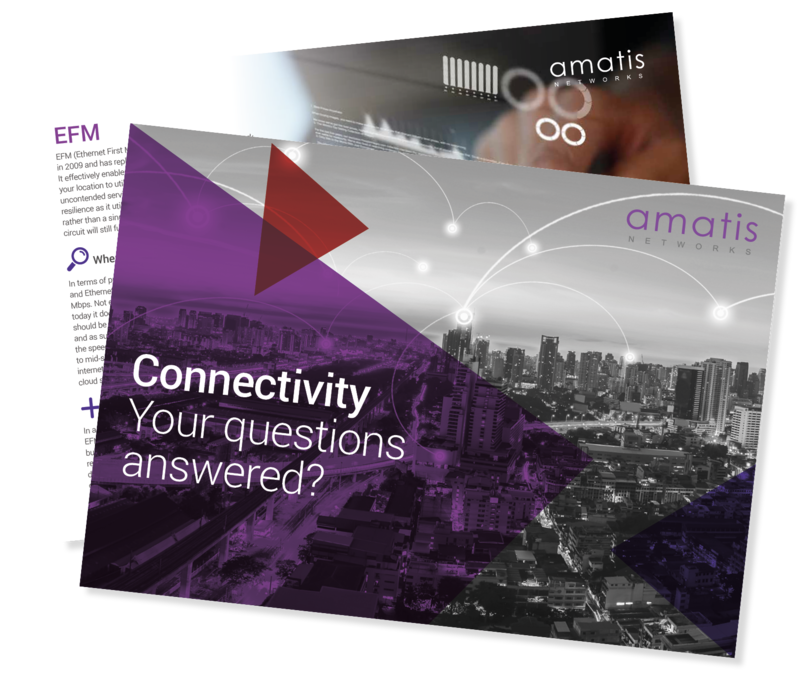 At amatis we have a comprehensive portfolio of connectivity services that we can offer; we do this so that we are able to put the customer’s needs first and then align the best service to meet these needs. We love to talk networking and connectivity so are more than happy to spend time with you to understand your business requirements, hear about your current challenges and explain to you what is possible and the pros and cons of each solution.